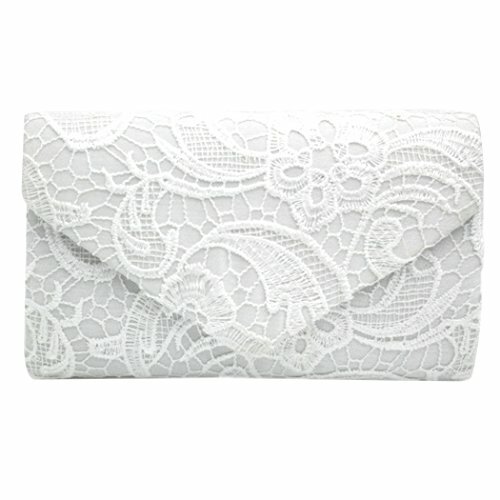 Material: This clutch purse is made of lace mesh material, non-toxic to use for long time. Dimensions: L*W*H: 22*5*13cm(8.66*1.97*5.12 inches). It can accommodate your phone, cash, perfume or other personal things. Versatile: This clutch bag is equipped with detachable shoulder chain, making it also can be used as crossbody bag or shoulder bag. Features: Lightweight and portable to carry anywhere. Special lace design makes it a great gift for yourself or your friends. Occasions: Suitable for wedding, dating, party, prom, work, shopping and other daily use.